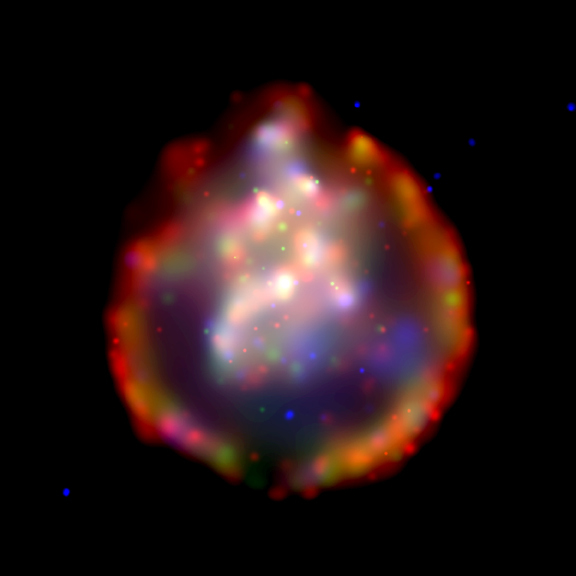 The striking Chandra image of supernova remnant, SNR 0103-72.6, reveals a nearly perfect ring about 150 light years in diameter surrounding a cloud of gas enriched in oxygen and shock heated to millions of degrees Celsius. The ring marks the outer limits of a shock wave produced as material ejected in the supernova explosion plows into the interstellar gas. 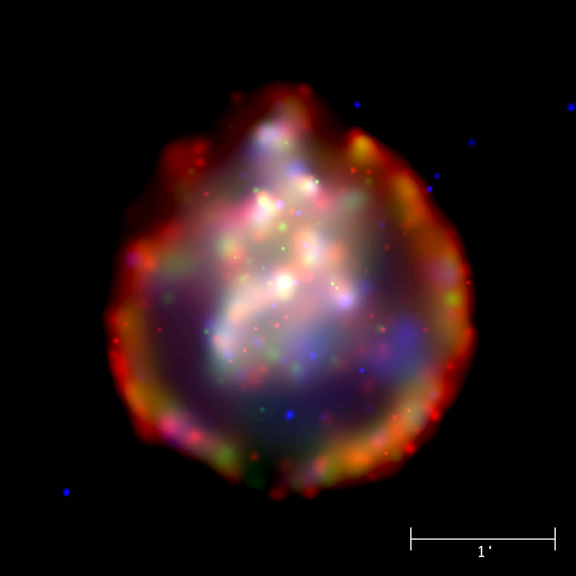 The size of the ring indicates that we see the supernova remnant as it was about 10,000 years after its progenitor star exploded. Oxygen and neon are the most abundant elements in the remnant, evidence that the star that exploded was at least ten times as massive as the Sun. Oxygen is synthesized by nuclear reactions in the interiors of such stars. When such a star explodes, its core collapses to form either a neutron star, or if massive enough, a black hole, and the material surrounding the core is propelled into interstellar space. Scientists have known for years that oxygen and many other elements necessary for life are created in massive stars and dispersed in supernova explosions, but few supernova remnants rich in these elements are observed. This is because the supernova ejecta become mixed with the interstellar gas after about 20 thousand years. Since most observed supernova remnants are older than this, only a few, younger remnants will still be rich in oxygen. SNR 0103-72.6 is located in the Small Magellanic Cloud (SMC) about 190,000 light years from Earth. The X-rays take about 190,000 years to reach us from the SMC, so the supernova explosion occurred about 200,000 years ago, as measured on Earth. One of the closest galaxies to our Galaxy, the SMC is visible to the naked eye from the Southern Hemisphere. This supernova remnant will become an important laboratory for studying how stars forge the elements necessary for life. Although SNR 0103-72.6 is more distant than supernova remnants in our Galaxy, scientists have a clear view of it because its light is not blocked by the dusty spiral arms of our Galaxy. Scale Image is 4 arcmin per side. Coordinates (J2000) RA 01h 05m 17.67s | Dec -72° 22' 12.3"